I was out and about on Saturday all by myself, and that does not happen often. OK, I attended the meeting of a local Toastmasters club and found myself in the vicinity of the Glass House Mountains National Park. As I drove down the road, Mt Beerwah, Mt Coonowrin and Mt Tibrogargan came into view and I felt a little tear moisten the corner of my eye. 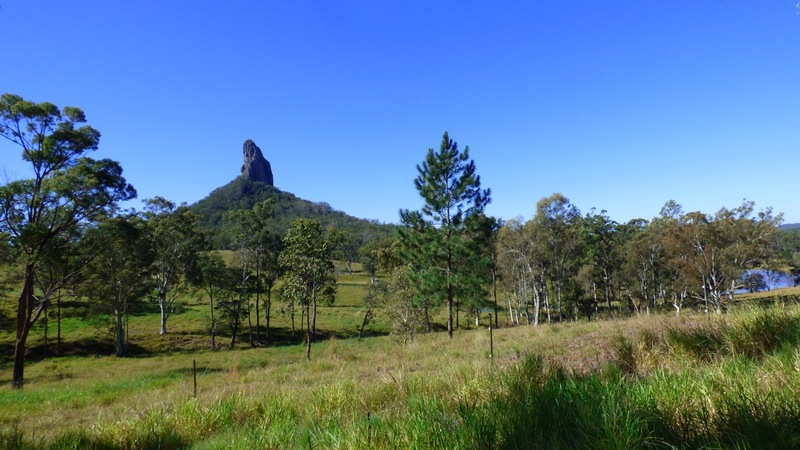 Sadly, the Glass House Mountains are not mountains at all but a group of eleven hills that rise abruptly from the coastal plain of the Sunshine Coast hinterland. The range originally formed as molten lava cooled in the cores of volcanoes around 26 million years ago and, over time, erosion has worn away the soft exterior layers, sculpting them into the dramatic shapes you see today. They were named by Captain James Cook in 1770 as the peaks reminded him of the glass furnaces in his home county of Yorkshire. I’ll have more photos to share soon as Dean and I are going bushwalking in the Glass House Mountains National Park today. So pretty… So glad you shared.